At the “Cycle City Active City” conference in Manchester in July Road Safety Minister Jesse Norman commended the work on policing close passing of cyclists sby PCs Mark Hodson and Steve Hudson of the West Midlands Police Road Harm Reduction Team (WMPRHRT), saying his Department “plans to build on it – it is a very effective way of building awareness and reducing casualties”. By now readers of posts on this site will be aware of the existence of operations policing the close passing of cyclists and related enforcement based on reducing road danger at source. Our last update of what is happening nationally is here. This post is about the work WMPRHRT carry out in general. For us they have been setting the Gold Standard for road danger reduction policing with the typical resources (the Metropolitan Police being the exception that proves the rule here) of a Police Service. The basic format is the same: plain clothes officers report ahead if they have been passed too closely; the driver is stopped and, generally using a mat, the driver then has Rule 163 of the Highway Code and its rationale explained to them. Some 26 of the 42 Police Services in the UK attended our September training day last year. In the last year they WMPRHRT have been partnered by West Midlands Fire Service, who now do much of the educational work. This allows the police to carry out operations with four officers (one cyclist, one safety officer generally on a motorcycle, with two stopping officers at the stop site). More training has been rolled out to West Mids fire crews to enable more close pass operations to take place. There is now a specific driver education power point presentation for anyone delivering roadside education: primarily aimed at Fire Service Crews, this will enable personnel to support close pass operations. For example: they have carried out a full day’s presentation to Royal Mail depot at Wednesbury. 30 drivers were given a presentation, practical input on the ‘mat with bike’ and also education on enforcement from Central Motorways Police Group.. This was very well received with lots of debate which was both constructive and thought provoking, getting the ‘drivers’ view of their relationship with cyclists. Royal Mail indicated that they had a positive impact. • There are at least ONE PER WEEK close pass operations in their area, carried out with neighbourhood teams, mainly of PCSOs. About 3 (including up to 2 motorcyclists) come from WMPRHRT with up to 6 from the neighbourhood team. Each operation takes up to 3 hours. • 9 – 16 vehicles are stopped for close passing in each operation. • Whereas the principal purpose of stopping drivers who have “close passed” is to provide education, with prosecution being reserved for other offences which come to light after the stop, in West Midlands, some prosecutions for close passing ARE made (under Section 2 of the 1988 Road Traffic Act: “careless driving” /”driving without due care and attention”). This occurs some 2 – 3 times per week. A big issue for local drivers, who have been engaged with to find out their views, is that there is a fear that if they do comply with 20 mph they will be “tailgated”. Consequently “tailgating” – driving too close to the vehicle in front – can be targeted. WMPRHRT police careless driving with regard to Rule 178 of the Highway Code, namely breaking of rules with regard to Advanced Stop Lines, to reduce “left hooking” incidents. 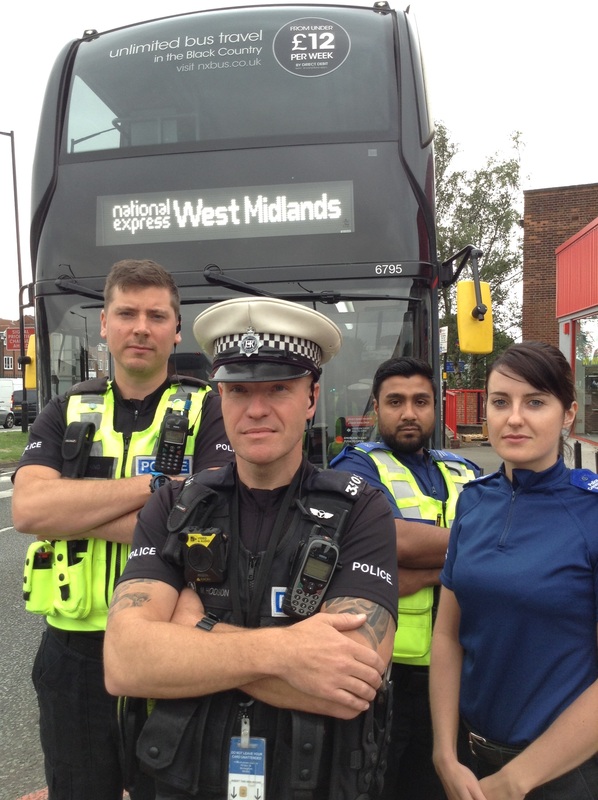 Pioneered a few weeks ago, WMPRHRT got a lot of media attention for the tactic of using officers in a bus to look down into cars and spot mobile phone use. #OpTopDeck out again this afternoon with @ST_Police crewing the bus in company with PC Hodson from our team. 41 mobile phone offences detected in 3 hours. The evidence from bus is fantastic even in the poor weather this afternoon. Offending observed & evidenced from feet away! As well as their award winning Twitter account, they have an important blog we strongly suggest you read. https://trafficwmp.wordpress.com/ . It hasn’t been added to for a while – the emphasis now will be more on “vlogging” – but it’s worth a read. This is an absolutely central part of the work WMPRHRT do. In conversation they make it clear that educational work, by itself, cannot be properly effective. With 3rd party reporting, they have had some 350 – 400 reports up until November last year. There are some 50 – 80 reports now per month.3 cases have gone to court and resulted in guilty verdicts under Section 3 of the 1988 Road Traffic Act. Other cases where there has been a refusal to nominate a driver are pursued. Whereas the on-road activity is educational, 3rd party reporting can result in prosecution. So far the ratio of education to enforcement (which results in either 3 points on the licence plus a fine, or a Driver Awareness training session) is 1:3. “This is “the big news”: after Operation Snap rolled out in Wales last year, we now have an extension of it for forces throughout the UK with Nextbase launching the National Dash Cam Safety Portal (NDCSP) “a website that allows road users – cyclists, horse riders, motorcyclists and pedestrians, as well as drivers – to easily send video of dodgy and dangerous behaviour to the relevant police forces via a single online hub.”. (For descriptions, see here and here ). Police forces linked to the portal via their own platforms include: Avon and Somerset Constabulary, Cheshire Constabulary, Essex Police, Hampshire Constabulary, the Metropolitan Police Force, Norfolk Constabulary, North Yorkshire Police, Suffolk Constabulary, Surrey Police, Sussex Police, Thames Valley Police, Dyfed-Powys Police, Gwent Police, North Wales Police, South Wales Police. Forces who will receive footage directly from the portal include: West Mercia Police, Warwickshire Police, West Midlands Police and Wiltshire Police. “I’m often asked if I’ve reported an incident I’ve shared. The reality is I only rarely do go to the police. Unfortunately going to the police is not easy. First, you need to hope you get a sympathetic officer. Sometimes you do. Sometimes you get sneered at. Sometimes you get dismissed. Sometimes you have to argue with them that, yes driving a car 30cm from my arm at 40mph is dangerous. Then, when they do take it seriously, it takes time to do the statement and burn the videos to CD. Then you rarely hear from the police again .. Sometimes after having sat in the witness room for 6 hours the PF comes to chat with you and lies about a problem with the paperwork which you later find out was completely false. If you are super lucky at this point the defendant admits guilty and you aren’t needed. If you are unlucky you need to go into court as a witness. That, I can assure you, is not fun. In fact, its pretty damn horrible. Not only do they pick at your evidence, if they see fit, they character assassinate you. For an hour and a half. Then, at the end they find the defendant not guilty because they can’t be identified in the footage. It matters not that they admit driving the car at the time, on that road, or that you shout out the reg, and the make of the car is obvious. Or they are found not guilty because its not breach of the peace to shout aggressively in someone’s face that they are young to beat you up,Or that the precise position of the car wheels are not know at a specific moment which might mean they didn’t drive their car at you. If, you get beyond that and they are miraculously found guilty, then they get a slap on the wrist with a small fine and a few points. Less than they’d get if they were caught holding a mobile phone Oh and the charge is reduced from Dangerous to careless, because…. it’s just easier that way and despite everything that happened, despite how bad the driving was and the crap you’ve had to go through, you still feel guilty for pursuing it all. For us, using 3rd party reporting as part of road danger reduction policing is critical. It is an absolutely key element, along with several others, of the work that West Midlands Road Harm Reduction Team, along with that of other officers in West Midlands Police and their partners, carries out. Others – step forward Surrey Roads Policing Unit for their excellent work on Twitter – do good work in a variety of areas. But at the moment WMPRHRT are setting the Gold Standard for road danger reduction policing. This entry was posted in Policing close passing of cyclists, Road Danger Reduction on September 29, 2018 by rdrf. I am a Senior Traffic Engineer working for Project Centre. We are currently working on behalf of Havering Council, where we have been commissioned to review the operation of the existing 20 mph zones within their borough, which includes the level of enforcement. As part of this area of work we have been asked to compare the method of enforcement in other boroughs. The ‘West Midland Road Harm Reduction’ Initiative was a highlighted a successful scheme. I have read the information provided in your website. Particularly of how successful you have been policing the traffic behaviour within 20 mph Zones/Limits in your jurisdiction. Therefore, I would appreciate if you can provide data/information of your enforcement strategy, or any outcome report. I’ll be in touch with WMPRHRT specifically on 20 mph. However, you should also be contacting Roads and Transport Metropolitan Police Service and TfL on this. Basically WMPRHRT has been prioritising 20 mph compared to other speed limits because of danger to pedestrians and cyclists and because 20 mph roads are often in particularly deprived areas. At present – although this is due to change – there is about one operation a week in WM, roughly 35 speeders caught each time. Hope this helps. Don’t forget to contact and work with the Met.